Sara Bickler (Hannah) is the Managing Director of Grain of Sand. Recent directing credits include a staged reading of Thomas Jefferson and George Mason Draft the Declaration of Independence for Grain of Sand and assistant directing the Theatre Lab's production of Rags. She has appeared onstage with Grain of Sand as the Queen in Raising Cane at the 2012 Capital Fringe Festival and as Gertrude in Hamlet: Reframed at the 2011 Capital Fringe Festival. Sara is a 2009 graduate of The Theatre Lab's Honors Conservatory. Pamela Leahigh (Julie/Gibson) is a local actor/playwright and graduate of The Theatre Lab Honors Conservatory. She is happy to be spending another Fringe summer on stage with Grain of Sand having also appeared in Raising Cane and Hamlet: Reframed. Pamela was last seen performing/drinking in a pub as Peter Quince in A Midummer Night's Dream and as Dogberry in Much Ado About Nothing. In her work with Borealis Theatre, she may have killed you with scissors or accidentally married you in a crosswalk. Other work includes Things I wrote before my first kiss (which she wrote and directed). Her plays have been seen at the Kennedy Center Page to Stage Playwright Slam and Theatre Lab's Dramathon. TV and film work includes Randy to the Rescue, House of Cards, Game Change, and The Wire. Mark Ludwick (Parker) is a government economist who also loves being on stage. In recent years, he has appeared in Washington’s Source, Capital Fringe, Madcap, and Inkubator Festivals and he is delighted to be performing in his first show with Grain of Sand. Mark is a 2007 graduate of The Theatre Lab’s Honors Conservatory. Mike Rudden (Logan) is proud to make his debut with Grain of Sand. A Michigan native, his recent credits include R.U.R. for Naked Theatre Company, The Importance of Being Earnest for Castaways Reperatory Theatre (awarded Best Leading Actor, 2012-13 season), The Lion in Winter for Vpstart Crow and One Flew Over the Cuckoo's Nest for Prince William Little Theatre. He also recently completed his Masters of Education at George Mason University, and teaches mathematics for Fairfax County Public Schools. Amal Saade (Charlie) is psyched to perform with Grain of Sand for the first time! Credits include work at Theater J, Taffey Punk, Olney Theatre, Source, 1st Stage, Rorschach, and three previous shows with Capital Fringe. She received her degree in theater from The University from North Carolina at Chapel Hill and is a graduate of the Theatre Lab’s Honors Acting Conservatory. A wholehearted thanks to Carl, Hunter, Christine, Rin, and the amazing cast. 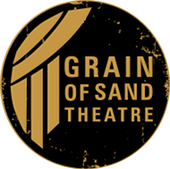 Carl Brandt Long (Director) is a founding member of Grain of Sand Theatre. For Grain of Sand, Carl directed the company's first production, Hamlet: Reframed, which won the award for Best Drama at the 2011 Capital Fringe Festival, appeared in You Can't Get a Decent Margarita at the North Pole and Raising Cane, and has choreographed the fights for everything the company has done to date. Other directing credits include Arcadia (Prince William Little Theatre), A Christmas Carol (Vpstart Crow), and Two Gentlemen of Verona (Cleveland Black Box Theatre). Carl has choreographed fights for over two dozen shows in the DC area, earning a WATCH award for his work on Deathtrap (McLean Community Players). Hunter Styles (Playwright) is the Artistic Director of Artists Bloc, a locally-focused workshop and presentation series for early-development performing arts pieces. He has written plays produced by Rorschach Theatre, Forum Theatre, and Wayward Theatre. His play All Apologies, about Kurt Cobain's afterlife, was produced by Bethesda troupe Flying V in September. He received a Helen Hayes Award nomination for co-directing the Andy Warhol musical POP! at The Studio 2ndStage in 2011 and has directed and assistant directed with Theater J, Rorschach Theatre, Synetic Theater, Doorway Arts Ensemble, Georgetown and American universities, and more. A member of the American Theater Critics Association, he has been writing for DC Theatre Scene since 2008 and for American Theatre magazine since 2012. He is currently a staff member at Signature Theatre in Arlington, VA and the Literary Manager at Factory 449.